Suggestions on what students need to do to succeed. Steps on preparing for career paths in middle school and high school, resume and tips for interviewing. Waseca Junior & Senior High School houses aproximately 1000 students in grades 7-12 and offers a rigorous curriculum which meets Minnesota standards while offering post-secondary preparation including College in the Schools and Advanced Placement Courses. Waseca Intermediate School has about 400 students in fourth through sixth grade, and exists to educate students on the path to reaching their full potential as learners. Our commitment is to collectively build upon established educational foundations and prepare students for future learning experiences. Hartley Elementary with about 500 students in grades kindergarten through third grade, takes great pride in high academic standards and quality programs for our students. The Waseca Area Learning Center – is dedicated to providing students a place where they can be engaged in meaningful learning that meets rigorous academic standards, become well prepared for post-secondary experiences, and continue to take pride in the reputation for excellence. Community Education’s mission is to provide leadership in the creation of lifelong learning, recreation and citizen involvement opportunities for all Waseca Public School District #829 residents. Sacred Heart School’s mission is to promote life-long learning and Christian values and has program for preschool and kindergarten. TEAM Academy’s focus is on academic excellence, posts-secondary attainment and a culture of respect and responsibility. Students are taught in small groups and participate in an individualized learning program on the computer. 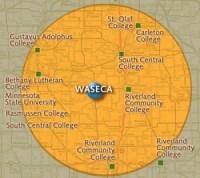 Waseca is within easy commuting distance from several college/university campuses.